If ever there is a year to stick those kids in ski school, it is this year! Why? Skiing and boarding in the Wasatch has been spectacular and we’ve been blessed by weekly storms bringing fresh turns. So this last weekend we put the Snowbasin Learning Center (a.k.a. DinoMites for Ages 4-6) to the test! I knew from the moment we walked in the door, this was going to be a fantastic day for all. 1. Make reservations ahead of time. This not only guarantees you a place, but cuts down on the paperwork when you arrive that morning. You can make reservations or find out more info by calling 801-620-1015. Honestly, if you arrive early, parking usually isn’t a problem. At 8:30 a.m. there was a little traffic entering Snowbasin Road but we still scored a close parking spot and chose to walk our crew and all their gear to the base. If you’d rather not fight that battle and have lots of gear to carry, simply pull all the way up front and drop off your gear, little people, and an adult while you go back and park the car. Third option? Snowbasin provides shuttles to and from the parking lot. And we hardly ever wait that long for one! 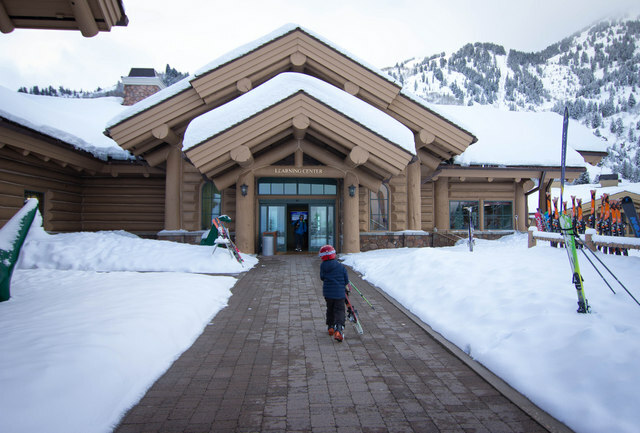 The Snowbasin Learning Center is located right next to the beginner hill and to the right of the Grizzly Center. We arrived early, checking in with the front desk around 8:45 a.m. even though her lesson didn’t officially start until 9:30 a.m. There are many kids and adults checking in for lessons, so it is just better to beat the rush. 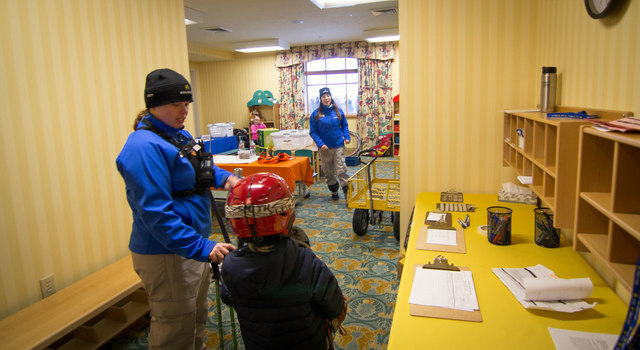 New this year, Snowbasin extended their check-in and pick-up times by an hour to accommodate early drop-offs and later pick-ups. 4. Drop off child at their room. New this year, the Dino-Mites and Raptors (ages 7-12) have rooms dedicated solely to their programs. 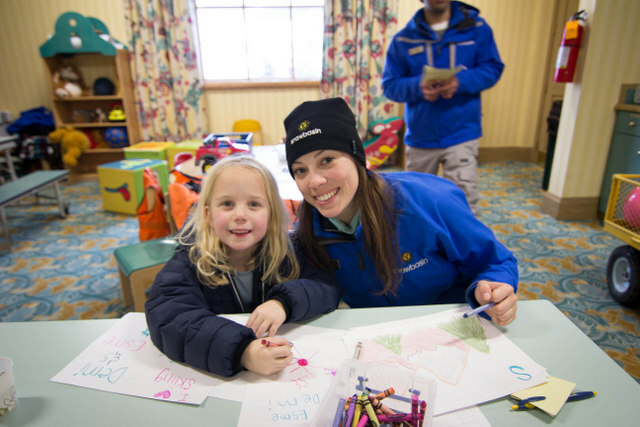 Each room has both on-snow instructors and indoor teachers to assist with crafts, lunch, hot chocolate, a movie, and any child that needs a break from the hill. This was comforting as a parent, knowing my child would be taken care of and having fun, no matter what the day seemed to bring. We showed Esme to her room. The staff put her name on her skis, poles, and helmet. She even had her own cubby to put all her ski stuff in while indoors. 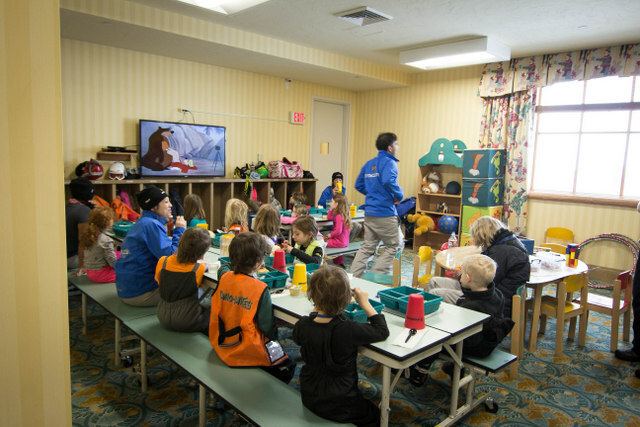 Each child is given a bright orange "race vest" to wear so they are easily identified on the ski hill. I sort of wished we had one all the time! 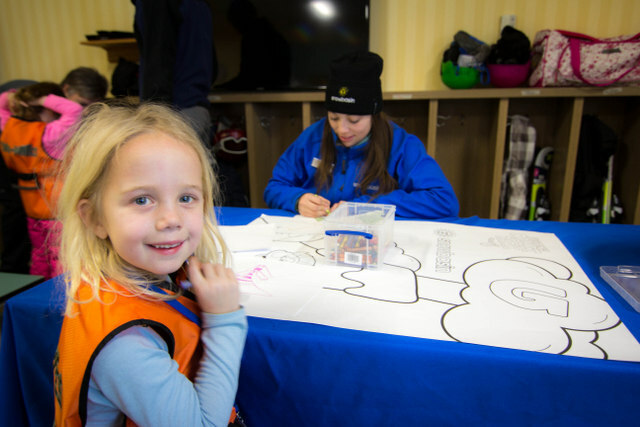 Esme made herself comfortable coloring while other kids built cities with blocks and pulled out games until it was time ski. Seeing that all our boxes were checked and Esme was all taken care of, it was time for us to hit the hill and so we did! We went powder hunting over at the Strawberry Gondola and enjoyed lunch in Earl’s Lodge. With a few inches of fresh powder, the turns were great! 5. If you want, stop in at lunch to see how everything is going. We snuck in at lunch when the kids and instructors returned to “home-base”. The children were able to watch a movie while enjoying chicken nuggets, apple sauce, cookies and a beverage. The lunch menu is rotating so they don’t have the same thing two days in a row. We didn’t want to make a spectacle, so we peaked in and then left, realizing she was having a blast and didn’t need any help from us! At 1 o’clock the movie was turned off, kids layered up, and everyone back on their skis! We picked up a smiling and bouncy Esme after 3:15 p.m. She was eager to share her day with us. In the morning our daughter skied with other kids in her class. 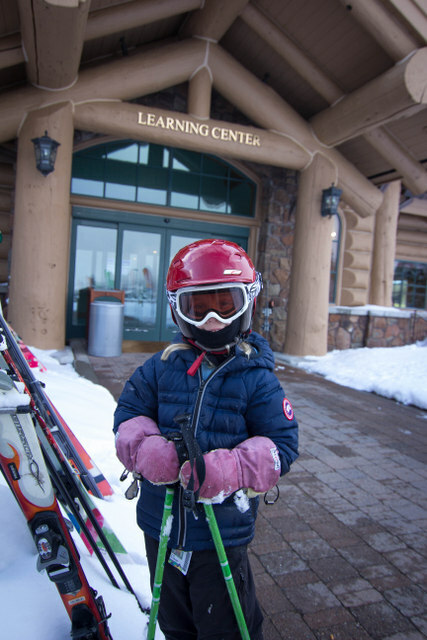 Snowbasin uses terrain-based learning to help teach kids to stop and turn on their skis. Their main goal is to have fun and build confidence at the younger levels. In the afternoon, Esme skied off the Needles Gondola with her teacher Deni. 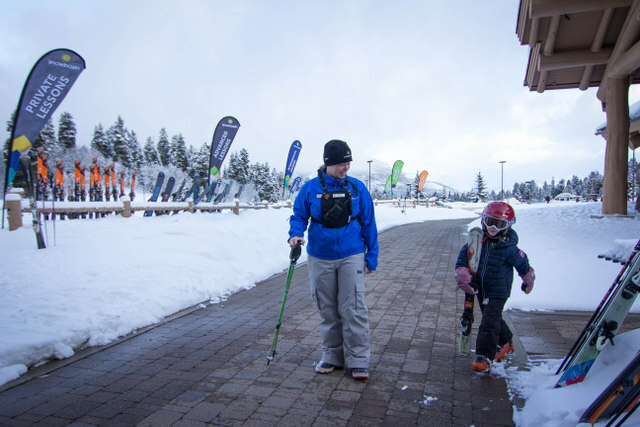 I appreciated that the staff gave her both the opportunity to practice her skills on harder terrain but also ski with other kids her age, something she doesn’t get to do very often. They were attentive to the differing skill levels of the kids in the group. We received a “report card” marking all the skills she had successfully performed and those that she was still working on. We were filled in on where they skied, what was learned, and what specific things we could help her with on days she is skiing with us. All in all, everyone had a great day. Snowbasin has a wonderful staff, both helpful, informative, and sensitive to the differing needs of each child. In fact, my only worry was that she would no longer want to ski with me anymore!